Register at Early Bird Rates for the National Young Feminist Leadership Conference! originally posted at the Feminist Campus blog. We’re thrilled to announce that Early Bird Registration is now open for the 10th Annual National Young Feminist Leadership Conference, taking place from March 29-31, 2014! You won’t want to miss out on this year’s NYFLC: there’s going to a a slew of workshops, panels, and plenary sessions ranging in topic from global women’s rights to campus organizing tips all featuring campus activists, feminist and political leaders, and other public figures. You’ll have the chance to take action, get inspired, network with other activists, and even grab some feminist gear or explore the nation’s capital. Our Early Bird rates are $25 for individuals and $20 per person for groups of 5 or more people. After Early Bird Registration closes, those rates will go up – so don’t hesitate! Register today. We’re also offering prizes to the largest delegations in attendance and the largest Early Bird Registration groups, so go ahead and register a friend as well! You can read more about the conference on our website and RSVP on Facebook to find friends, arrange carpools, and make plans with other registered folks. You can also tell us how excited you are on Twitter using the hashtag #NYFLC2014! 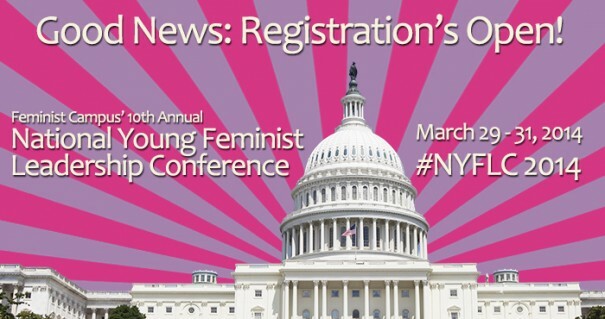 If you have any questions, concerns, or unique needs, or know you’ll be registering a group, don’t hesitate to contact us at nyflc@feminist.org or call 703-522-2214 and ask to speak to a conference representative. We’re looking forward to seeing a diverse array of feminists at the conference this year, and we hope you’ll join us in celebrating a decade of young feminist action and leadership across the nation. Save a seat at NYFLC 2014 today – and we’ll see you in March! Young feminists tweeting, blogging, and making change! Check out the Feminist Majority Foundation's CHOICES Feminist Campus Leadership Program at feministcampus.org. Is a senior in high school allowed to attend? YES! Definitely. We’ll have breakout sessions for high schoolers and have had younger feminists attend in the past. Everyone is welcome! Hi! I’m from Philippines and I badly want to participate in this event. Is there a chance I could find an organization which can sponsor my expenses for my round trip ticket? Thank you! i will be very happy to be at this conference.because it is going to help me to broadcast “the power of women in africa”that is the “can do”spirit.